A strange thing Karma? I was thinking to myself “i wonder when that Blu-ray i pre-ordered is going to turn up?”. Blow me when i got home there it was laying on the hall floor. Spooky! 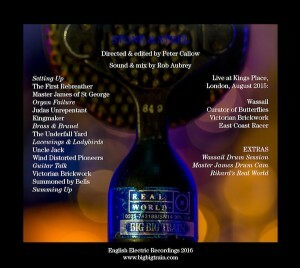 The Blu-ray to which i refer is the latest release by one of my favourite institutions Big Big Train. Stone And Steel is a beautifully packaged visual document of the bands week long rehearsal sessions filmed at Real World Studio’s in Wiltshire. The views of Real World shown throughout the event really shows what a fabulous environment for creativity and tranquillity the place is and stands as Peter Gabriel’s legacy to fellow musicians in which to rehearse or record, in this case both. beautifully directed and edited by Peter Callow who managed to not only capture the magic of the performances but the atmosphere of the very special surroundings. Somewhere i would love to visit. There is little i can say about the songs included within this package that i haven’t already written about elsewhere on the site. Seeing the songs brought to life in a live setting though is a shear joy. Letting the film roll instead of choosing options of song selection or scenes allows the natural progression from the band setting up their positions and instruments to the tinkering with studio instruments namely an ailing Hammond organ appears to be broken as confirmed by keyboard and guitar guest Rikard Sjoblom announcing that it is suffering from organ failure. Great too to see IQ sound Engineer Rob Aubrey working his magic in the studio as he usually does. In fact the team assembled here is nothing short of a dream team. Keyboard and bass player Danny Manners takes a stroll around with his video camera as people are setting up showing the vast array of instruments and musicians chatting to Dave Gregory about his guitars and Greg Spawton’s bass pedals etc. Great for the musical nerds like myself. Even the rehearsal of the brass section is included which seems to make sense of everything when heard in context. Sound quality throughout the disc whether it be two channel stereo or 5.1 surround sound is stunning. Hats off to all concerned. the rehearsal footage is an absolute pleasure to watch and songs like Judas Unrepentant and Uncle Jack are played seamlessly and come across to the listener as vibrant with the sense of being brought to life from the original audio recordings. the visual dimension is to be savoured. Picture quality is very much as you would expect and show both the band and Real World at their very best. Pin sharp with luscious colours. What is special about this disc is the inclusion of songs recorded at Kings Place in 2015. Anyone who managed to obtain a ticket for any of the two nights and one matinee performances will know just how special these gigs were. Four of the songs played over the three performances are included here and capture the vibe beautifully. From the folklore laden Wassail with singer David Longdon wearing a mask adding theatrics to the pacey and atmospheric East Coast Racer all of these live songs had me clapping between convinced i was actually there again. Of the Kings Place songs Curator Of Butterflies had tears forming in my eyes such was it beauty and sentiment. Dave Gregory’s guitar playing throughout this song was so fluid making the song flow injecting passion and feel. Victorian Brickworks finds the band in full all out Prog mode with the different elements and time signatures throughout and had me reminiscing about my experience watching and meeting the band at a very special venue. With only a very basic lighting rig and a screen hoisted aloft showing tasteful, complimentary footage Big Big Trains resources were utilised elsewhere assuring the quality of instrumentation, sound and musical perfection. One thing that did strike me was how much like Sonny the android from the movie I Robot David Longdon reminded me of whilst he was looking around the auditorium during one of his introductions. 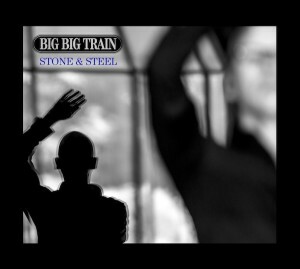 For any Big Big Train fan Stone & Steel is a necessity for anyone wishing to what all the fuss is about then i would recommend starting here and working back over until you have discovered just how special this band is. The accompanying booklet is well put together and finishes of the package perfectly. Stone & Steel isn’t something i am simply going to enjoy watching over and over again, it is something i am going to covet. Stone & Steel £15:00 + £1:50 UK P&P.